You know, sometimes, multiple versions of five mainstream browsers just isn’t enough. 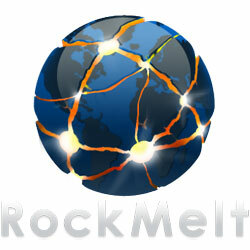 Step forward RockMelt — a startup founded by Eric Vishria and Tim Howes. They intend to launch a new and improved web browser into an increasingly-crowded market. What makes RockMelt different (and news-worthy) is that it’s been backed by Marc Andreessen, the founder of Netscape Communications Corporation. Netscape developed the Internet’s first graphical browser and introduced millions of people to the early web in the mid-1990s. Although Netscape was trounced by Microsoft in the first browser war, Mr Andreessen has moved on to become a prominent Silicon Valley financier. There are all kinds of things that you would do differently if you are building a browser from scratch. Although he doesn’t elaborate on what those different things are, there has speculation that the new browser could offer tighter integration with social networks such as Facebook. Browser competition is a good thing. We should never return to the monopolistic days of IE6. If your daily job involves web application testing, it’s about to become even more secure! Can RockMelt offer anything new? Will it be more than a nice logo? Are multiple browsers a help or a hindrance?